The kids are back to school finally. I think Tyler is going to do well at his new middle school this year - next year he's off to HIGH SCHOOL! Yikes! He's been doing fairly well without his meds, sleeping and growing like a weed. Kayleigh is now taller than her 5th grade teacher... and there's something else different about her - read on. 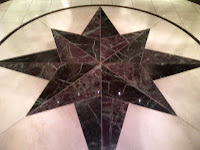 The marble entry of the Grand Hyatt in Buckhead (Atlanta, GA). 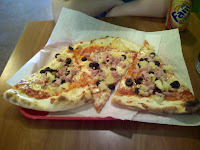 We have a new family-operated pizzaria here in Westwood - they do custom slices. 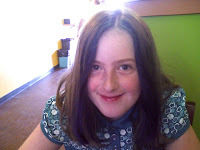 Oh yeah - Kayleigh had her hair dyed blue in front. Alyssa, who did hair and makeup on Ordinary Angels, works at Salon Fauntleroy in West Seattle, and does the family hairs. This was her work, and I must say it looks cool. Having been a teenager in the '80s, I'm no stranger to brightly colored hair, so this is really low on my list of parental battles. She wanted streaks throughout, but we compromised (with Alyssa's help) on the front streaks. The strong blue really makes her eyes pop. So far everyone at school loves it. Her teacher says she will probably start a trend. 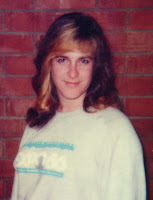 Sam used to have a blonde streak in front when she was 18 or 19. 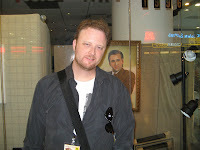 OA got a nice nod from this film connoisseur, who saw the premiere in Atlanta. Scroll down to his writeups and look for 'O'. Thanks, man! DVDs will be available in a few days from FilmBaby. Watch this space! Who'd a thought that blue hair would become so popular!? Hee hee. Sounds like you had a great time in Atlanta. I can't wait to see OA. oh my - K looks so much like Sam. Glad school is off to a good start for both kids.